(Newser) – As Carter Wilkerson prepped for final exams and attended his prom, he also kept dreaming of one other thing: chicken nuggets, and the retweets that would lead him to trayloads of them. The New York Times reports that dream came true this week as the 16-year-old junior from Reno, Nev., known as "Nugget Kid," broke Ellen DeGeneres' record of (at last glance) just over 3.4 million retweets of a single tweet, sent during the 2014 Oscars. 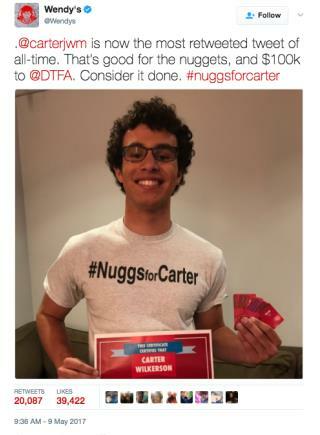 Carter's record, which currently boasts about 13,000 more retweets than DeGeneres', has earned him a year's supply of Wendy's chicken nuggets, thanks to a friendly challenge he made with the fast-food chain in early April. Technically, Wendy's had a much higher benchmark in response to Carter's original query, which asked how many retweets he'd need to win 365 days' worth of breaded chicken goodness from the restaurant. The chain letter has met its match. In a year he'll be suing Wendy's for something medically related to eating nuggets for a year straight.